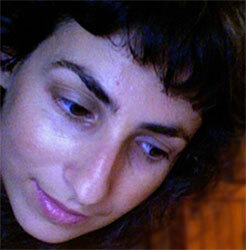 Eri Skyrgianni was born and raised in Athens. She lived in Ithaca, Lefkada, Volos, Xanthi, Samothraki, Barcelona, Thessaloniki and now she is back in Athens. At 4, she was introduced to Art when she was given a book of Paul Klee and a book of Giorgos Bouzianis. She is interested in nature, water, chaos, the Fractalistic structure of the Universe and the interconnection of all things and beings, under the philosophy and practices of Deep Ecology. She has worked as a Fine Art and Photography instructor at several public and private schools and other education institutes. Some years ago, she used to shoot on super8 film but now, minidv sadly and gladly has taken its place. She loves to do Video Art with no narrative content. She wants video to be the tool for a "kinetik" work with Painting's qualities.